Jeff Locke, of the Redstone section of Conway, NH, and a pitcher for the Altoona Curve, AA affiliate of the Pittsburgh Pirates, returned to pitch in New England for the first time since his standout days for the Kennett High School Eagles. Taking the mound in Portland, Maine's Hadlock field, Jeff struck out 8 Portland Sea Dogs, allowing only 3 hits in 7 scoreless innings, and picked up the 1-0 victory before a sellout crowd of 7,368. It was estimated that appx 1,000 of those in attendance came from the Conway area in support of Jeff. 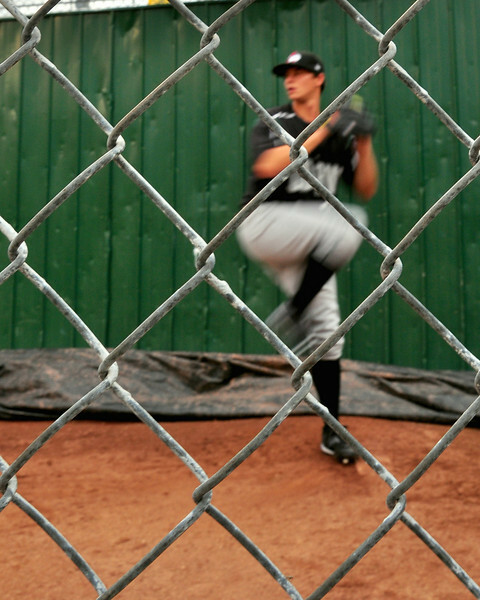 Redstone native, and former Kennett High School pitcher, Jeff Locke, warms up in the bullpen prior the game between The Altoona Curve and The Portland Sea Dogs. The 22 year old Locke recorded his first AA victory, 1-0, at Hadlock Field in Portland, on August 18th, 2010.